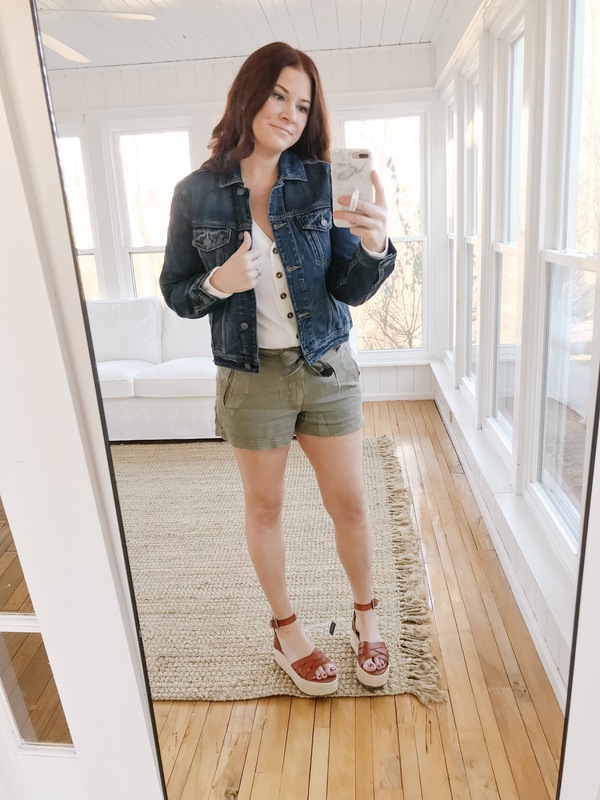 I’ve rounded up a HUGE try on of my favorite American Eagle Outfitter Spring items! 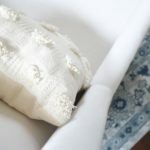 What I loved most about this selection was that all of the pieces were interchangeable, effortlessly working with each other as well as existing pieced in your wardrobe! 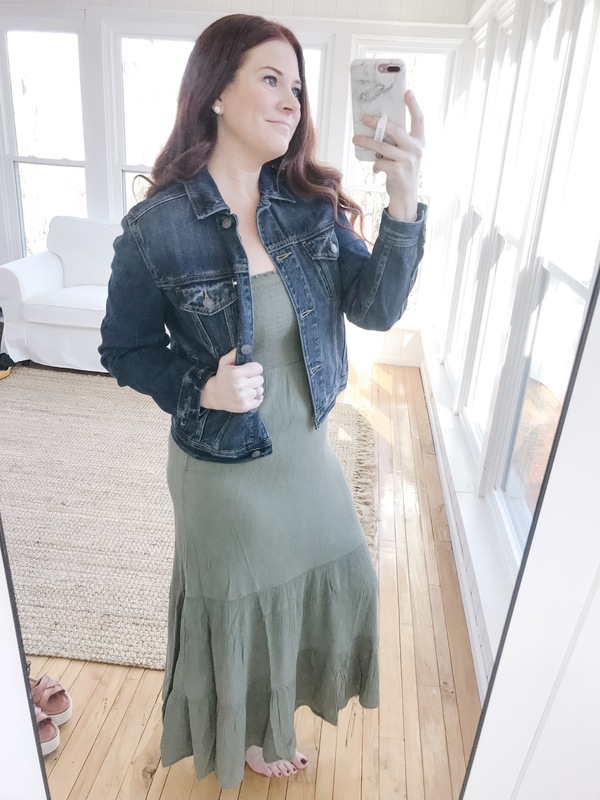 I’ve never actually ordered anything from AEO so I consulted with a friend who suggested sizing up, so I did! This top was super comfy as well, great tucked in and for layering! The ESSENTIAL jean jacket. I literally could have layered this over every single outfit. Its a great dark wash and true to size. 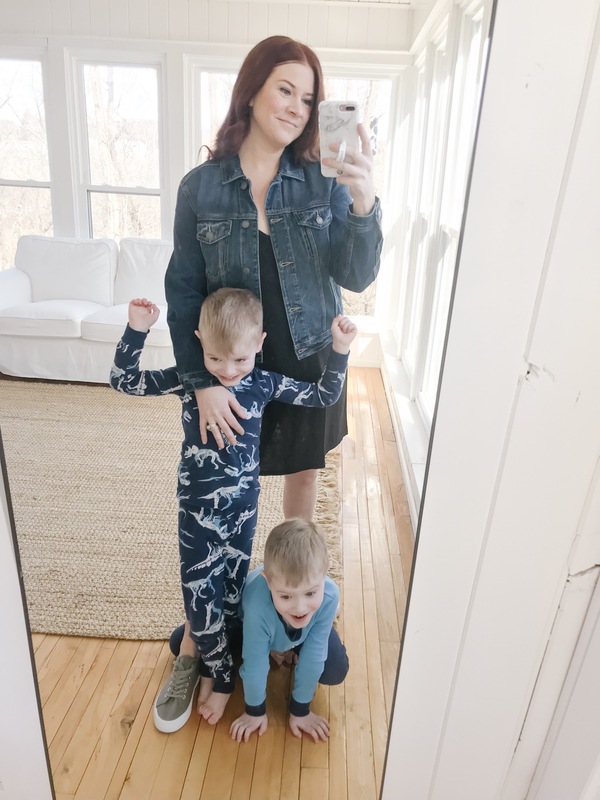 Initially, I wasn’t so sure about these shoes…. But after further review, they go with everything, are super comfy, and affordable! A must have for sure. Who doesn’t love a good T shirt? AEO had a ton of great options to choose from. I sized up two sizes, but probably could have done just going up one size. These shorts were a great destroyed, cut off option. I sized up one but could have definitely gone up one more size for an extra relaxed fit. I am completely obsessed with these sneakers! 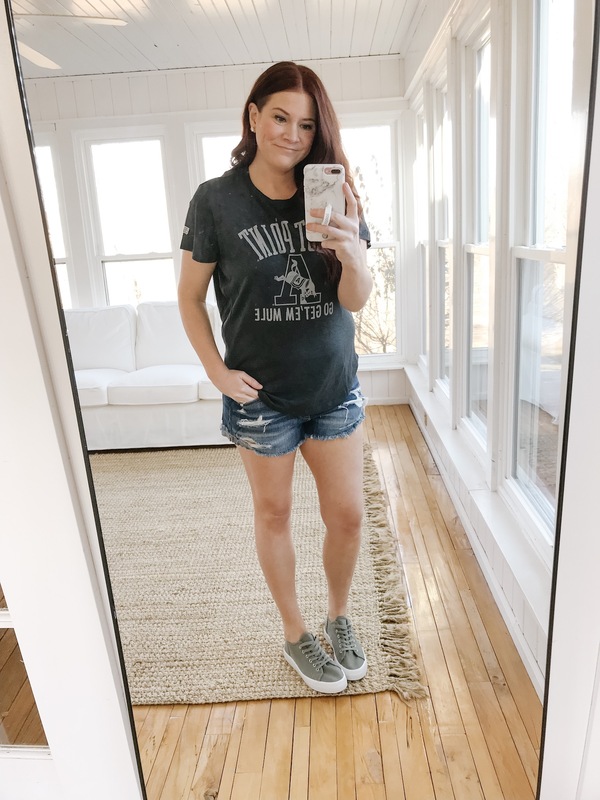 Literally go with everything, are super affordable and comfy! Swapped out the shorts for some stretchy high waisted white jeans. I sized up for these and loved them! 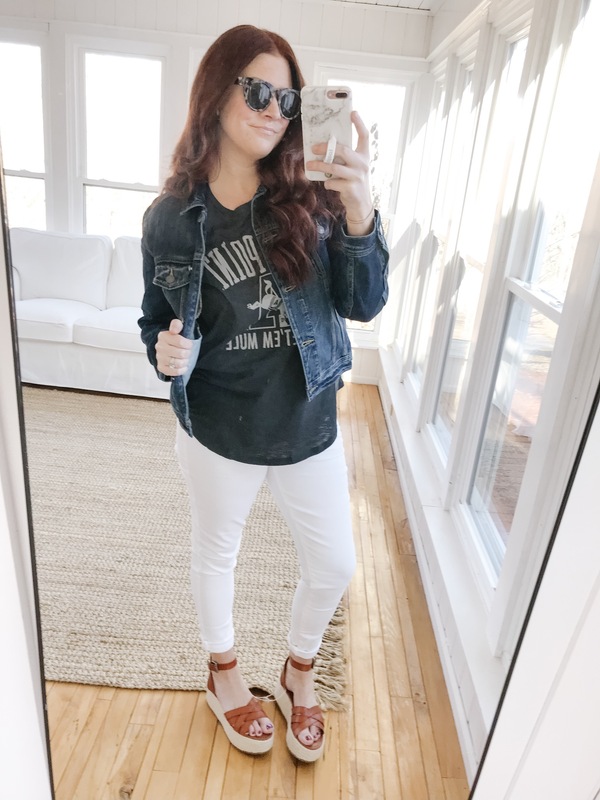 Same college T, jean jacket, espadrilles AND toroid sunglasses! I was so excited when I found these. They’re a lighter tortoise, which is hard to find affordably, and they’re comfortable too! 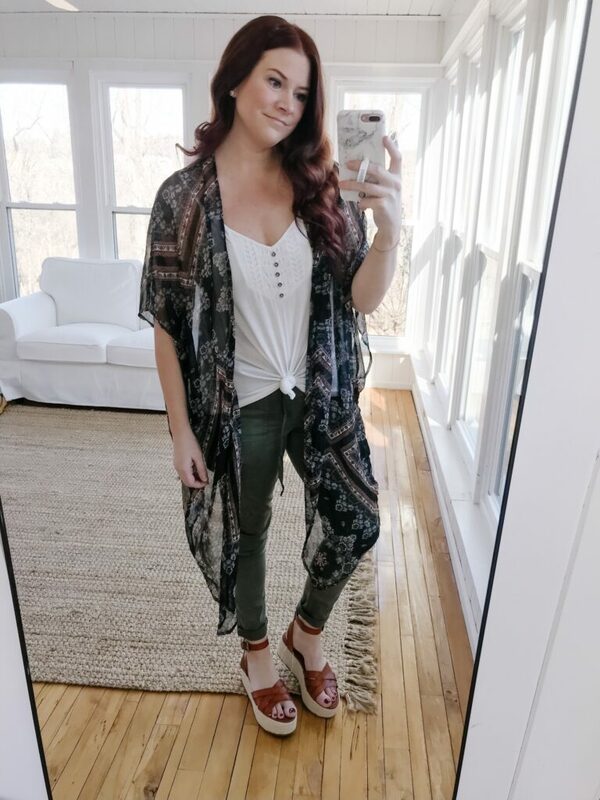 Same jeans and shoes, and swapped in a great loose fitting lace detail tank under this amazing kimono! You can tie up the tank, leave it loose or tuck it. Comes in a bunch of colors! Can we talk about this kimono?! It literally goes with everything and is the perfect color palette. 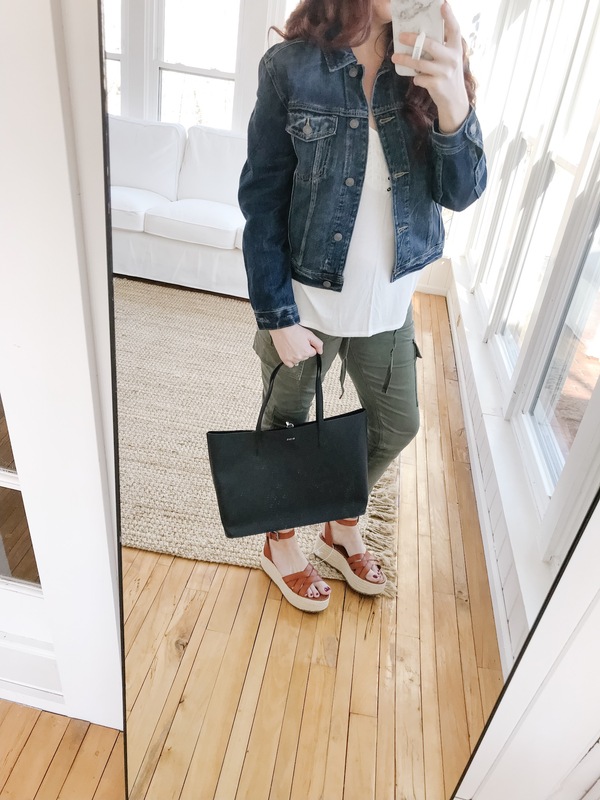 Super functional for Spring and Summer and great for layering when you want to be a little covered up! Swapped in this adorable peplum tank in gray. It has a button detail down the front and tie straps. So so cute! 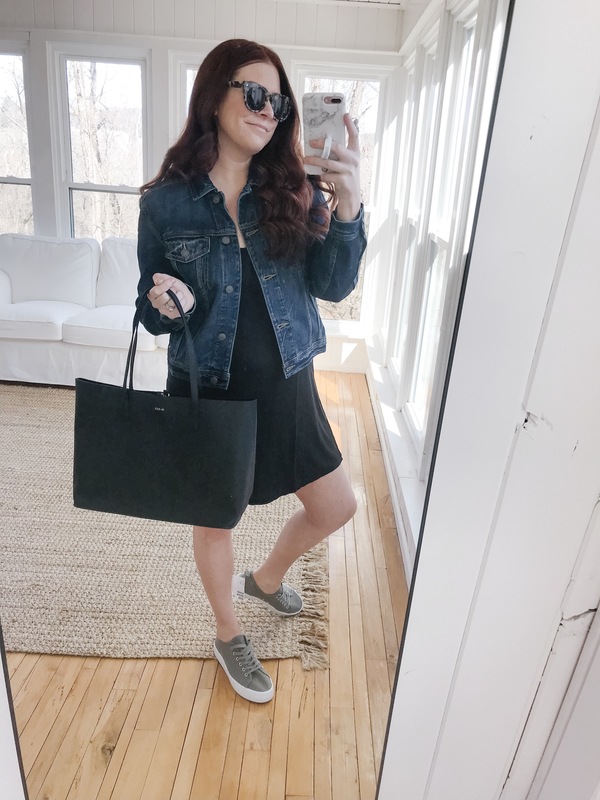 Obsessed with this simple black tote! 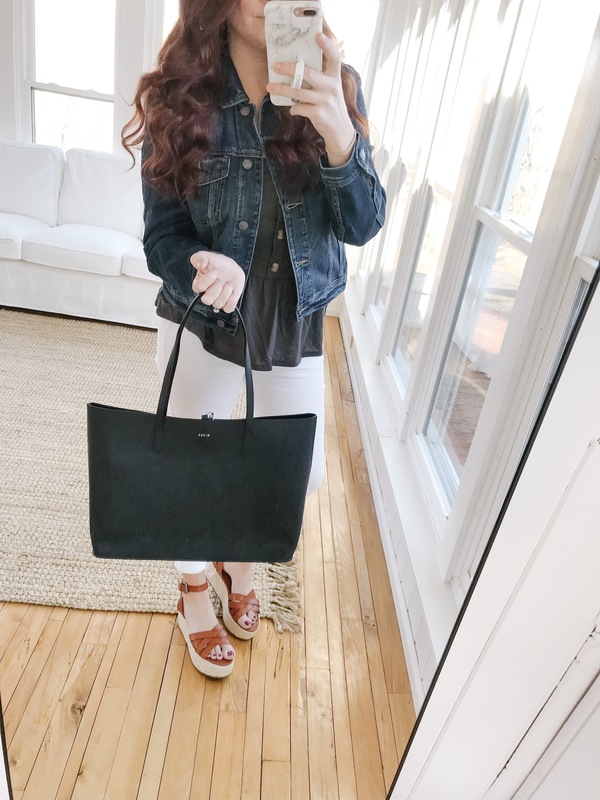 It’s a great everyday bag for anyone! 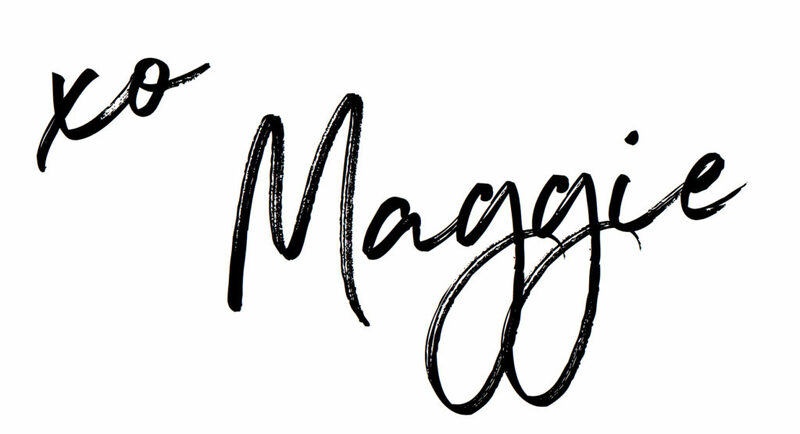 Comes in a couple different colors and for under $30! Swapped in the same tank in the “black” color, although it’s more of a charcoal. AND swapped in these medium wash, button fly, high waisted skinny jeans. 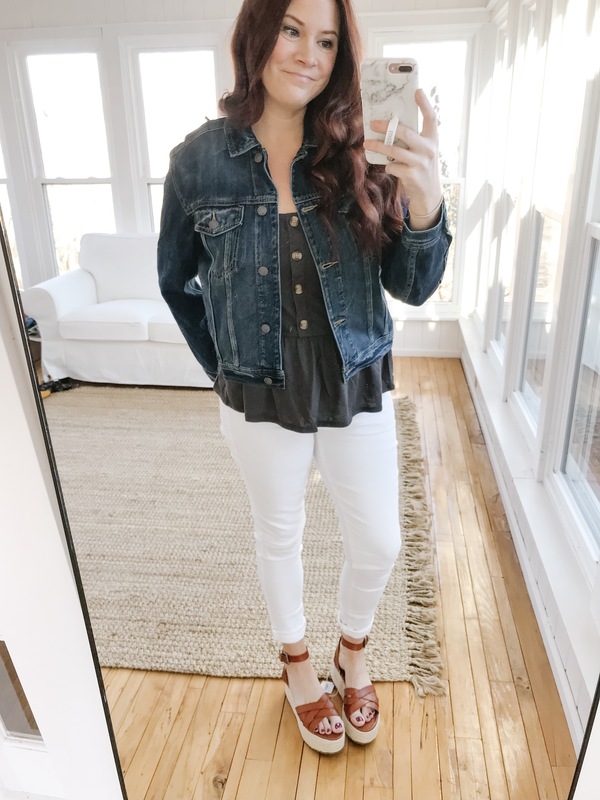 A great option if you’re looking for a medium wash jean to add to your closet! 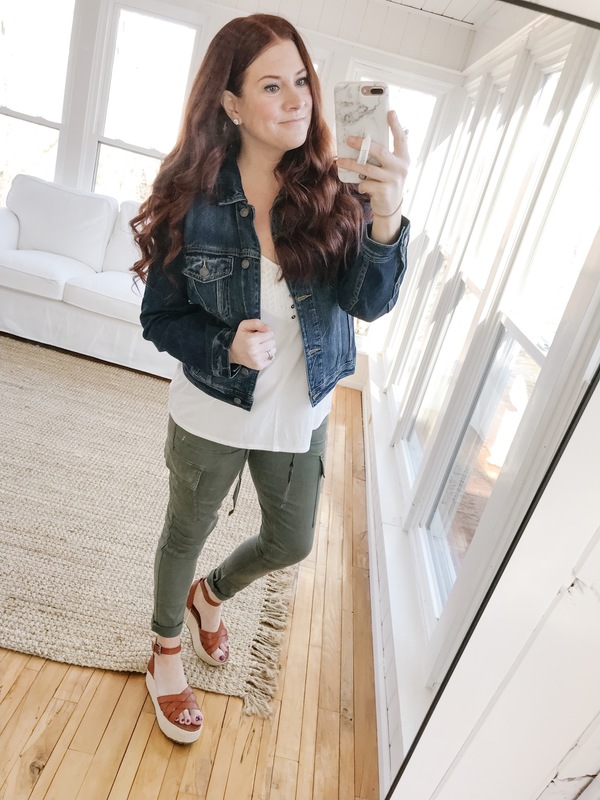 Same lace detail tank, jean jacket, and sandals paired with these adorable olive utility pants! These pants have functional pockets on the side, and a drawstring at the waist. They’re super stretchy and comfortable, run TTS. 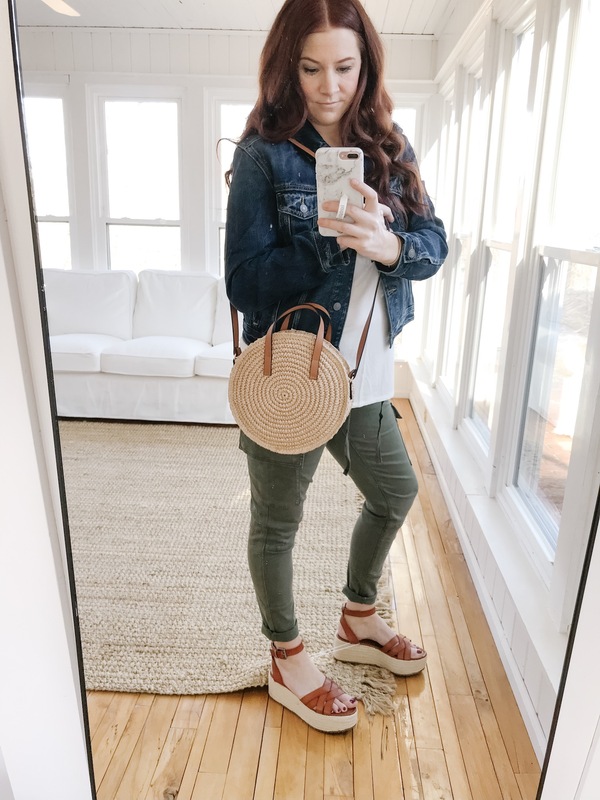 Added in the world’s cutest woven cross body! It’s under $30 and also comes in all black. 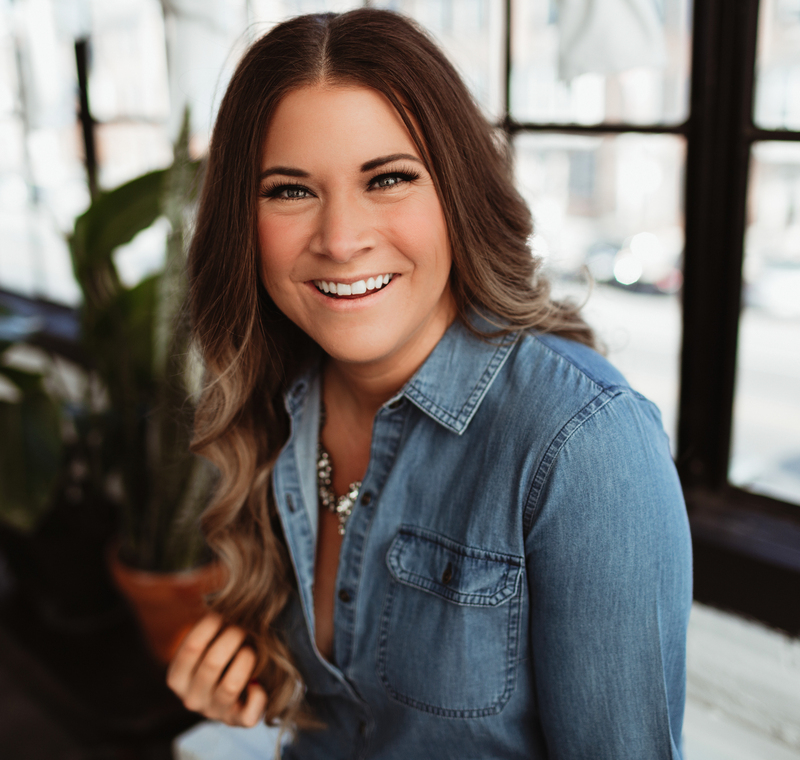 Seriously such a steal and the cutest version of this look I’ve seen yet! I grabbed this chic blush chain cross body. I love the details, especially the tassel! 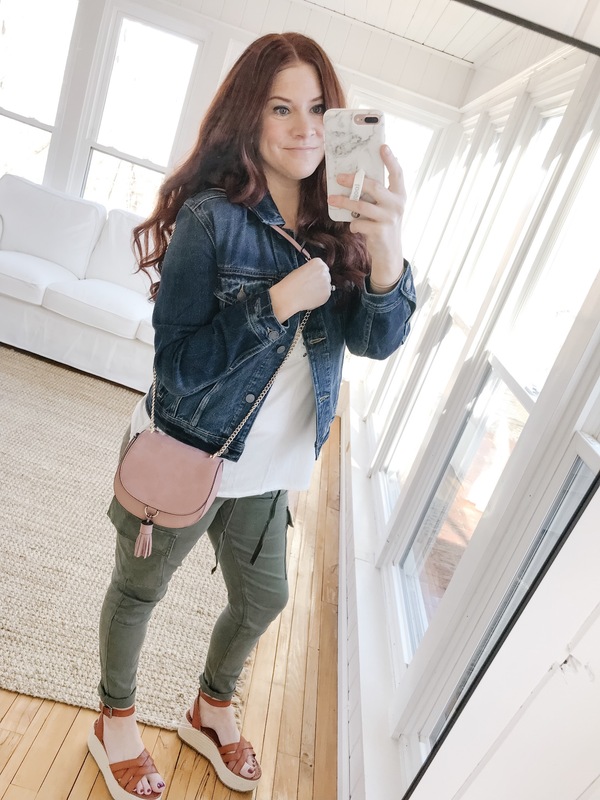 Who doesn’t need a new cross body you can dress up or dress down? Comes in a bunch of different colors too. Ordered this maxi in green to try. I liked the color and the smocking at the top. The mid section was a bit tighter than I expected so I would size up one if you’d like a looser fit. The length hit right above my ankle so I’d consider it more of a midi than a maxi. Comes in several colors. I really don’t do a ton of rompers but thought I’d get a little wild and see what this one was like. 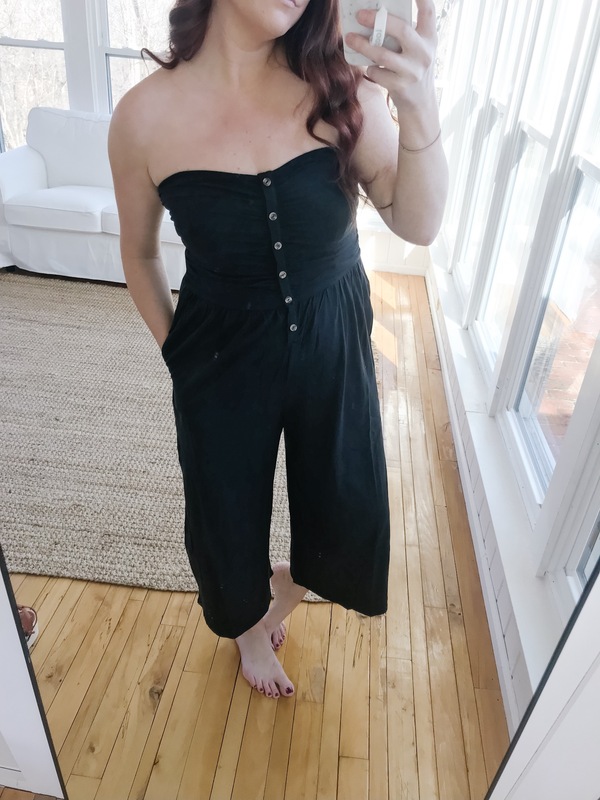 Overall it was extremely comfortable, and actually cute! The color was a dark charcoal, and was the softest material ever. Would be cute with wedges and a denim jacket. 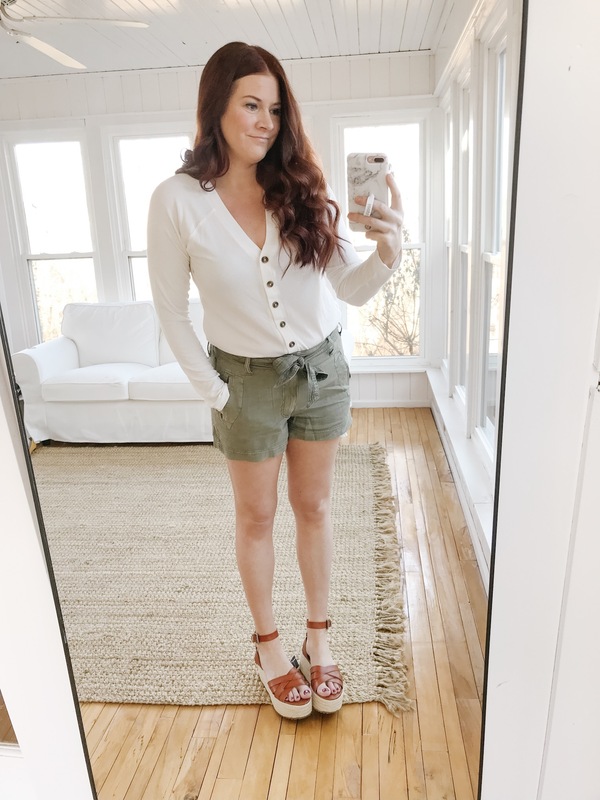 If you love a romper this would be a great option! Another great everyday outfit option. This dress is a v-neck in front and back with tie straps. Comes in a couple colors. Can dress it up a bit or even throw on as a swim coverup. I loved it paired with my H&M accessories for a “run around town” type of look. I hope you guys found some piece you love! As always you can shop any of the items you see in the try on by clicking the product image in the slider below the try on picture. For no additional cost to you, when ever possible shop through the retailers website versus the app, this way I’m able to get credit for the referral! Happy Spring babes!